No. 3 UCLA gets some breathing room as Rachel Garcia cracks a 3-run shot to left to put the Bruins up 6-2 on Cal State Fullerton. The Wildcats run rule the Fighting Irish with an 8-0 victory, sweeping the Lexington Regional. Head coach Beth Torina discusses how the Tigers continue to excel in close games and what the seniors have provided this season. The Bulldogs head to the NCAA super regionals for the second time in three years with a 9-7 victory against the Wildcats. The Lady Vols secure their spot in the super regionals, slowing down the Bobcats' offense with eight strikeouts. Jessie Warren makes a diving stop at third to end the game and advance Florida State to the Super Regionals with a 10-0 win over Jacksonville State. South Carolina prevails in the bottom of the seventh inning as senior Krystan White hits a walk-off home run against Hofstra. The Crimson Tide run rules the Badgers after five innings, throwing a one-hitter to advance in the NCAA tournament. Nine SEC teams advanced. Five Pac-12 teams advanced. All the seeds advanced. But the regional round of the NCAA softball tournament was anything but routine. For starters, you had third-seeded UCLA fighting for life as Sunday turned to Monday before holding off Cal State Fullerton 6-4 in an elimination game. You had five no-hitters, including one on Sunday by Florida's Aleshia Ocasio. You had a walk-off, inside-the-park home run and a team that had two grand slams in a single day. And, of course, you had rain. Lots and lots of rain. But the super regionals are set, and before you circle UCLA-Arizona, here's how the regionals were won. As recently as 2009, the listed attendance for the final home game Oregon played was 351 people at old Howe Field, a venue that was "historic" and "scenic" the way apartments the size of closets are "cozy." There were almost 10 times as many people on Saturday inside Jane Sanders Stadium, a new facility that is the envy of the Pac-12. That's what happens when you win 27 consecutive games in NCAA tournament regionals, the second-longest active streak in the nation after Alabama. Miranda Elish was in sixth grade when the streak began in coach Mike White's first season with the Ducks, but her second shutout of this year's regional helped Oregon beat Drake 3-0 and reach its ninth consecutive super regional. The game wasn't easy -- Drake got the tying run to the plate in the fifth and sixth innings. The weekend wasn't always easy -- despite not giving up a run in the regional, Oregon was tied or led by a single run for more than half the time. But with a shutout streak that now stretches 30 innings, the Ducks are moving on. Just like every year. 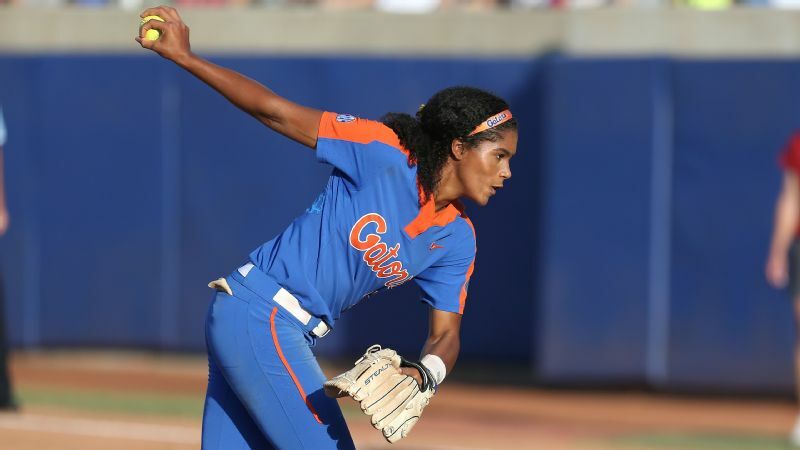 Aleshia Ocasio threw a no-hitter against Ohio State to send Florida to the super regionals. Oklahoma's Shay Knighten got three hits in one game Sunday. Georgia's Alyssa DiCarlo got three home runs in one game over the weekend. Florida's opponents got three hits in a weekend. The whole weekend. Good luck with that. The Gators themselves just about proved it isn't impossible Sunday against Ohio State, but it is difficult to beat what you can't hit. And senior Aleshia Ocasio was actually unhittable in her next-to-last weekend playing in Gainesville. After combining on a no-hitter with Kelly Barnhill against Bethune Cookman on Friday and closing out Saturday's win against Ohio State with some no-hit relief, Ocasio threw her third career solo no-hitter in Sunday's 4-0 win. For Ohio State hitters, the experience presumably wasn't worth the seven-hour wait for weather delays. This Florida team may not feel invincible to the same degree as some past iterations. It trailed Alabama in an SEC quarterfinal. It trailed South Carolina in the SEC championship game. It even trailed Ohio State by two runs in Saturday's game. But that's the thing, the Gators never trail by very much, which means there is never very much pressure on their lineup to sacrifice the patience that does things like produce two runs before the first hit -- as happened Sunday. By walk, sacrifice, fielder's choice or hit -- all means by which they scored against the Buckeyes in the regional final -- the Gators will get runs. Often lots. Even if they usually only need a few. Oklahoma faced four elimination games in its regional a season ago and went on to win the national championship. On the way to its national title in 2009, Washington played 15 innings with its season on the line in a regional final. So maybe UCLA is just getting started. What we know is the Bruins aren't done. Even if they came closer than any seed during the opening week of the NCAA tournament. One of only three seeds that had to play winner-take-all elimination games in the double-elimination format, UCLA was the only one that also trailed in its finale. After beating Cal State Fullerton once Sunday just to get to the final game, UCLA trailed 2-1 into the fourth inning and risked becoming the highest seed eliminated in regionals since 2011. 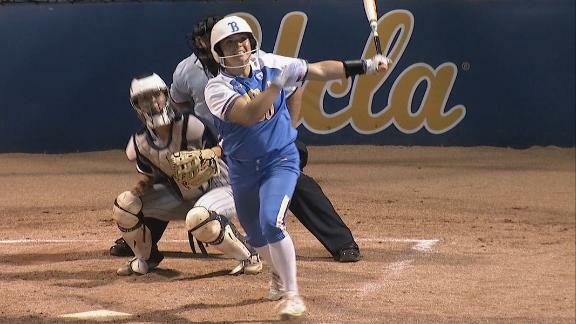 But with Pac-12 player of the year and national player of the year finalist Rachel Garcia throwing every pitch for the second time in as many games Sunday, and hitting the three-run home run that offered breathing room she ultimately needed, UCLA beat Fullerton 6-4 to advance. This wasn't solely a Garcia show. 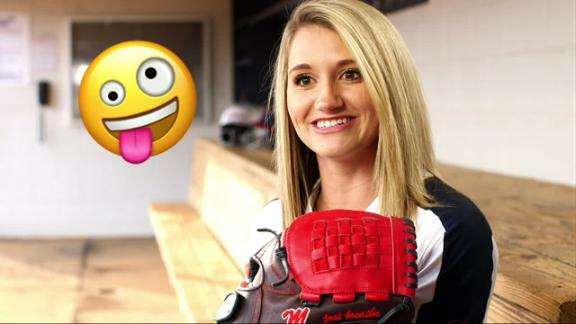 While asked to do it all, she threw only one more pitch in two games Sunday than in one extra-innings marathon against Mississippi in a 2017 super regional. (For that matter, she also fell well short of the 395 pitches Lawrie threw on the final day of her close call.) And while Garcia's home run took the edge off the finale, Bubba Nickles, who had seven RBIs in the regional, and Briana Perez had some of the day's biggest hits. Still, the relaxed demeanor in the face of everything from expectations to errors behind her to a finger on her pitching hand that needed treatment on multiple occasions only adds to the legend that Garcia is crafting. How much can one person do? As much as is needed it seems. UCLA now hosts Arizona in the first super regional installment of softball's biggest rivalry, one that has seen the two Pac-12 programs combine for 19 NCAA championships. Even at home and at a time when Garcia was still throwing limited innings, the Wildcats were no match for the Bruins earlier this season. UCLA scored 24 runs in a three-game sweep just over a month ago. Paige Parker, who was in a minor car accident on Friday, returned to the circle and helped Oklahoma advance. Oklahoma scored 26 runs in its regional a season ago. It scored 24 runs this season. The difference is it needed 82 fewer at-bats -- not to mention one less day -- to get there. The Sooners finished the Sunday of regionals a season ago still not sure if their title defense would continue. Weather delays meant they had to wait until Monday to play, and eventually win, their fourth consecutive elimination game of that regional. 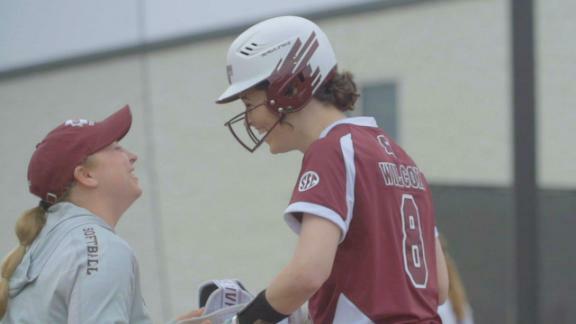 This time around, with all apologies to Missouri, the Sooners could start to breathe easy as soon as coach Patty Gasso turned in the lineup card with Paige Parker's name included as the starting pitcher. Unavailable a day earlier, according to coach Patty Gasso, after a minor car accident left her with a sore back, Parker was back in the circle Sunday. She was a little wild early but allowed just three hits and no walks before she gave way to Paige Lowary in the fifth inning (putting Lowary in position to eliminate her former school). Oklahoma already had a 5-0 lead by that time, courtesy in large part of Shay Knighten. 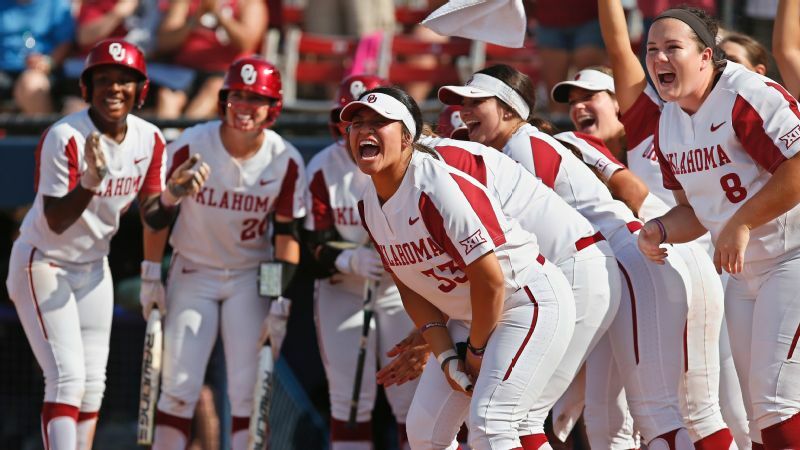 Seeing perennial postseason star Knighten go 3-for-3 with two RBIs after a season spent managing physical ailments of her own should be almost as encouraging for the Sooners as Parker's pitching. The Sooners can't quite put last year's drama fully behind them -- incoming super regional opponent Arkansas was the first team Oklahoma beat in its regional comeback a season ago. But the two-time defending champions played very much like a team looking toward a third. A month ago today, Washington was the No. 1 team in the nation and was heading to Los Angeles to prove it against UCLA. The Huskies' bags were packed with noteworthy numbers: They were 41-2, they had posted four straight Pac-12 sweeps, they had the best team ERA in the country. Shall we just say they hit a road bump and leave it at that? The Huskies were swept by UCLA, and then again the following week at home by Oregon. And all of a sudden it was fashionable to point out the Huskies' flaws. But the Huskies showed flashes of their pre-April 20 selves in three wins in Seattle. Take the deciding fifth inning in a 5-2 win over Minnesota that clinched a super regional spot. Note the recurring word. Trailing 2-1, senior Trysten Melhart led off with a single. She made her way to second on a sacrifice bunt and to third on a wild pitch. Senior Taylor Van Zee singled up the middle on 1-2 pitch to knock in Melhart. Sophomore Sis Bates followed that with a single and scored on senior Julia DePonte's double down the line on the sixth pitch of the at-bat. Bates came around to score on a ground out by senior Kirstyn Thomas. That's a whole lot of seniors. Kylee Hanson took a perfect game into the sixth inning, and the Florida State offense wore out the bases with eight hits, 10 walks and four hit-by-pitches. 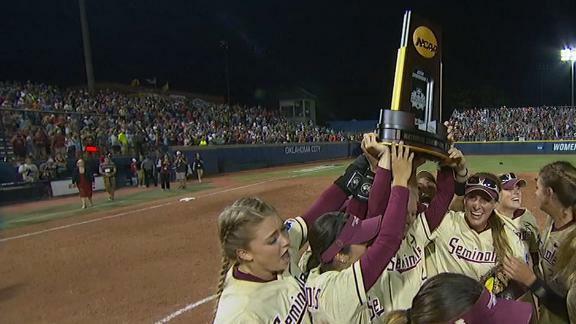 It all added up to a 10-0 Seminoles win and a spot in the super regionals. Hanson, a senior transfer from Florida Atlantic, no-hit Jacksonville State on Friday. She followed that up with another dominant performance on Sunday, giving up just one hit in six innings. All told, Hanson pitched 11 innings and allowed the one hit and struck out 24. Meghan King, who got the start in the Seminoles' win over Auburn, was no slouch, either. King went eight innings against the Tigers and gave up a run and three hits. The Seminoles, in the super regionals for the sixth straight year, will face the winner of the Baton Rouge regional next. In a season that saw something of a pitching renaissance across the country, can a team hit its way to Oklahoma City? Sunday's regional final against Northwestern suggested that remains the question for Georgia. As the final piece of a weekend in which the Bulldogs scored 27 runs and generally mashed the ball, Sunday's 9-7 win also suggested this is a lineup you would want at your disposal if you were going to try to answer that question in the affirmative. 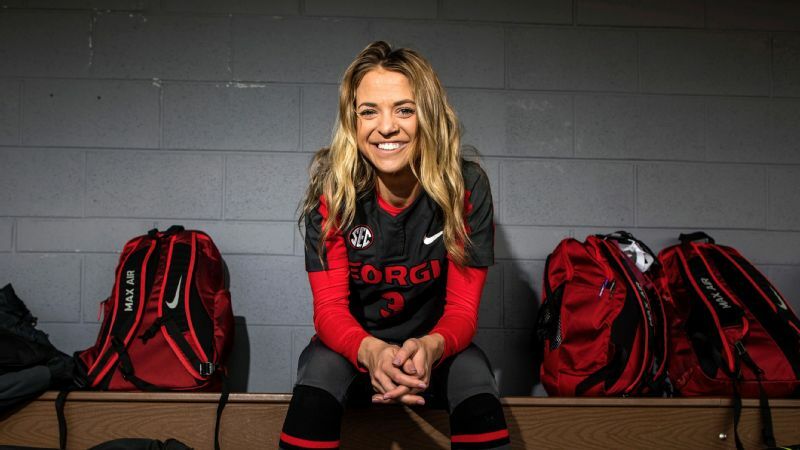 Georgia's regional finished before most of the country took the field Sunday, but like a golfer throwing out a low round in the morning, the Bulldogs set an offensive standard for everyone else to chase with those runs on 30 hits -- including Alyssa DiCarlo's record-tying three home runs Saturday. Some of that production was circumstantial. Neither Harvard nor Northwestern ranked in the top 150 in the nation in ERA -- and that was before a rash of illegal pitches for the Wildcats. But just as aces can control regionals, the Georgia lineup that ranks in the top 10 in runs, slugging and on-base percentages and batting average asserted itself. Pitching ace Brittany Gray went down with a season-ending injury in April. Georgia allowed 48 runs in 37 games before the injury. It has allowed 68 runs in 20 games since. The Bulldogs aren't without pitching -- Mary Wilson Avant is in pretty good company as just one of four pitchers to shut out super regional opponent Tennessee this season. But we knew offense would have to carry this team in the postseason. It didn't disappoint in its first opportunity. Arizona State is the lone super regional host that may need to introduce itself to many fans. Not the program, mind you. We're not that far removed from Katie Cochran in 2008 or Dallas Escobedo in 2011, when the Sun Devils ruled the sport. But this particular team. 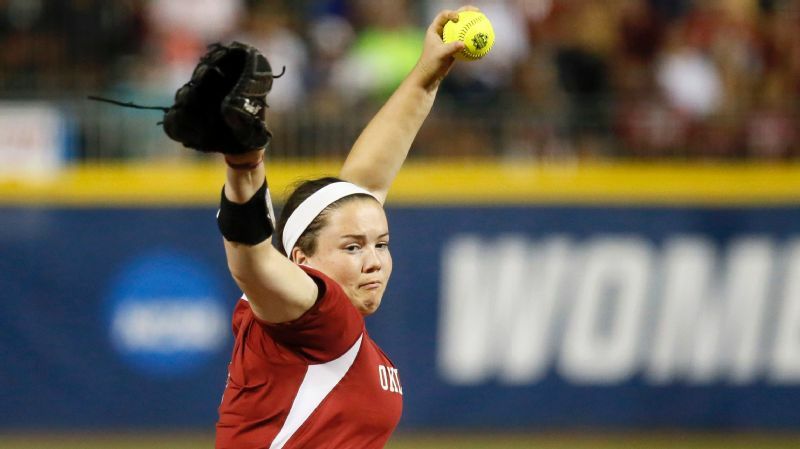 We've seen Oregon's Megan Kleist and Oklahoma's Paige Parker pitch in the World Series. We've seen Florida State's Jessie Warren and Florida's Amanda Lorenz swing for the fences in Oklahoma City. Just about all of the favorites have players who have been there and done that in May. Absent not just from the World Series but also super regionals since 2013, Arizona State spent much of its weekend, especially Sunday's 9-0 win against Mississippi, playing like a team eager to make our acquaintance. More specifically, hitting like a team that wants the big stage. The star all season for the Sun Devils, pitcher G Juarez was excellent in the regional, especially when needed in a low-scoring opener. But it was the rest of the team that jumped all over Ole Miss in the next two games, never more than in the first inning Sunday. They scored by going big on DeNae Chatman's home run. They scored by going small with an infield single, two bunts, two steals and a sacrifice fly. They chased an experienced postseason pitcher in Kaitlin Lee and kept applying pressure until they had the run-rule win. They looked like a super regional lineup from top to bottom. With South Carolina set to visit for a super regional between programs on the rise, the World Series is guaranteed a team that hasn't been there with any of its current players. But we'll know them soon enough. South Carolina staved off elimination in walk-off fashion Saturday night. It held on with a 2-0 win Sunday afternoon. Sunday night, the Gamecocks clinched a trip to the super regionals. Behind Cayla Drotar's shutout, South Carolina won for the third time in 24 hours, twice beating Liberty on Sunday to get within two wins of the Women's College World Series. South Carolina won its opener in the Columbia regional but lost to Liberty 3-1 in the winners' bracket. The Gamecocks were down to their last out against Hofstra on Saturday when Jana Johns worked a two-out walk to set up Krystan White's walk-off two-run homer in a 5-4 win. That meant South Carolina needed to beat Liberty twice on Sunday to advance. In the first game, Drotar crushed a two-run homer to left field in the third inning, while Dixie Raley shut down Liberty with a three-hit shutout. Drotar and White came through again in the rematch. Drotar, who went 20-6 with a 2.20 ERA entering Sunday, kept Liberty off the board, pitching out of a two-on, one-out jam in the fourth inning and retiring 11 of the last 13 batters she faced. White went 2-for-3 with two runs scored, her RBI double starting the Gamecocks' four-run outburst in the sixth inning to all but seal the 5-0 victory. Tennessee's road to the super regionals had been all about Meghan Gregg. The senior, who is Tennessee's all-time leader in home runs and RBIs, worked her usual magic at the plate during the Lady Vols' first two wins. She had five RBIs, which brought her season total to 72 and her career total to 263, seven away from the SEC career record, which Auburn's Kasey Cooper set last season (270). But on Sunday it was a junior who entered the game with just four RBIs on the season, and 14 in her career, who helped extend both Tennessee's season and Gregg's pursuit of the record. With Tennessee up by two runs, Haley Bearden hit a two-run single to give Tennessee a cushion as it advanced to it the super regionals for the 10th time with a 5-1 win over Ohio. In the circle, Caylan Arnold went the distance and gave up just four hits and struck out eight. Tennessee will travel to SEC rival Georgia for the super regionals. LSU held opponents scoreless in 27 of 29 innings during its regional. The Tigers still found themselves on the cusp of postseason oblivion as afternoon gave way to evening on Sunday. Which sums up the LSU softball experience well. World Series participants each of the past three seasons with pitchers Carley Hoover and Allie Walljasper, the Tigers always seem to find a way -- in this case a 3-1 win in the winner-take-all finale against rival Louisiana-Lafayette. But darned if that path is always obvious for a team that began Sunday seventh in the nation in ERA and 157th in slugging. In this case, it was the unlikely run production of Michaela Schlattman. The day looked to be easy until Louisiana-Lafayette scored four runs in the sixth inning to pull even in what proved to be the first game of the day, then won in 10 innings. In the second game, Walljasper gave the Tigers a chance to win with her pitching, but it wasn't until Schlattman doubled home Shemiah Sanchez in the sixth inning to put the Tigers in front in the finale that LSU found its path to victory. A transfer from Miami who had two home runs as recently as three weeks ago, Schlattman hit her seventh home run of the season in the day's first game. Up next is Florida State and a rematch of a super regional from a season ago. It will be the third season in a row the Tigers are on the road for a super regional, and, as is their Modus operandi, they lost the opening game and then rallied to win two in a row in each case. Alexis Osorio struck out nine and gave up one hit to help send Alabama into the super regionals. Unless you are from Corvallis, you had to be rooting for Alabama's Alexis Osorio to get the no-hitter in a regional final against Oregon State, if only to see if she kept the poker face on the final out. During his in-game interview on television, Alabama coach Patrick Murphy said that in four years of coaching Osorio and three years watching her in travel softball, he hadn't seen the expression on her face change when she was in the circle. It barely qualified as hyperbole. So while Alabama's Bailey Hemphill got the fans cheering with a big hit in the first inning that continued her late-season hot streak, and Sydney Booker, Elissa Brown and Demi Turner got them dancing with the speed and short game that pushed the lead into comfortable territory in the fifth inning, Osorio kept the poker face in the circle and kept pitching. 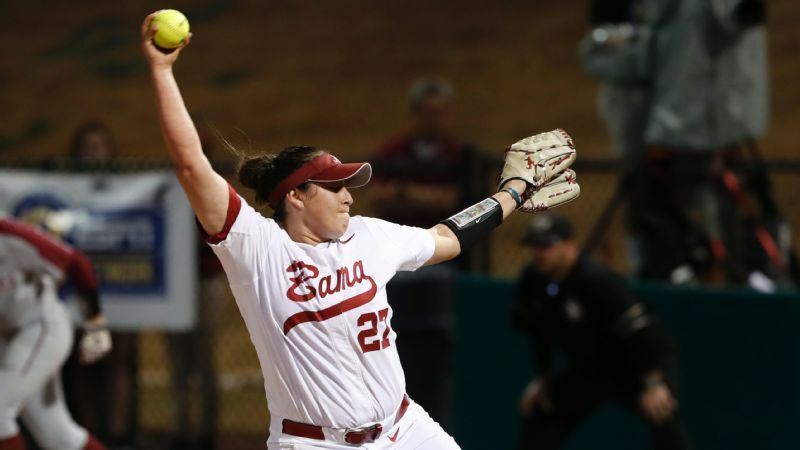 She gave up her first hit with one out in the seventh inning and kept pitching until Alabama had its 6-0 win. Osorio allowed two hits in 12 innings in the regional. An up-and-down team offensively all year, Alabama scored 23 runs in three games. Few teams enter super regionals playing better. Alabama's 6-0 win was its 37th in a row in regional play, the longest active streak in the nation. It will play in its 14th consecutive super regional -- which is to say, all the super regional rounds. Every successful program has a turning point on the path to sustainability. If Sunday proves to be that day for Arkansas, few will remember that the final step was a little messy -- that the first batter Mary Haff faced hit a double that gave Wichita State the lead. More will remember that hosting its first regional, Arkansas swept three games to reach its first super regional. They will definitely remember Haff and Hannah McEwen, stars of the class that changed everything. With the luxury of a game to spare, Arkansas didn't start Haff in the regional final after the freshman ace threw two-hit and one-hit shutouts, respectively, in her first two tournament appearances. 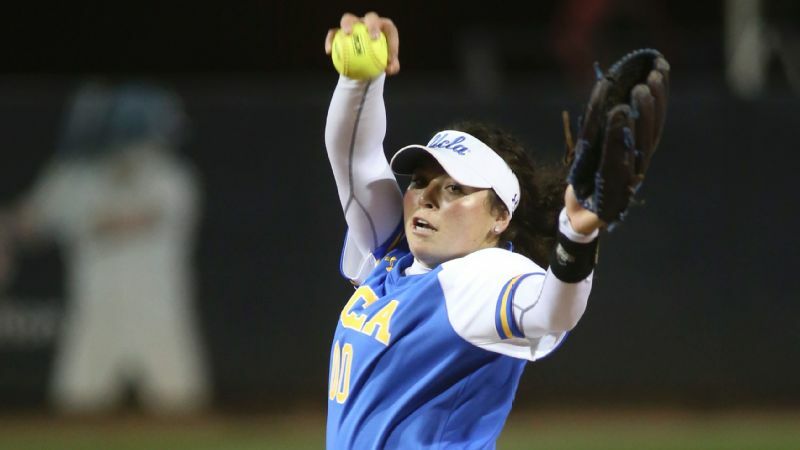 But after the inauspicious start to her relief appearance Sunday, those two runs officially on the ledger of the pitcher she replaced, she allowed just one more hit and no runs in nearly five innings -- ending the fourth, fifth and sixth innings with strikeouts. And McEwen, the team's leading run producer all season, delivered the two-run home run in the fourth inning that reclaimed the lead for good. Haff and McEwen had to believe Arkansas could be the kind of program that played in super regionals because they had no evidence to go on -- the program went 2-46 in the SEC when those two were sophomore and juniors in high school. So it's fitting that the two freshmen played such central roles in making sure future Razorbacks don't have to go on faith alone that it's a program that can do special things in the postseason. Runs are proving harder than usual to come by at the wrong time of year for Arizona, but the Wildcats have another week to get back in the groove thanks to the pitching of Taylor McQuillin. Arizona capped a regional sweep Sunday with a 4-3 win against Mississippi State. But in three games against that team, Saint Francis and North Dakota State, the Wildcats totaled 11 runs -- that after scoring six runs in a three-game series against Pac-12 cellar dweller Stanford to close the regular season. A team can certainly win with 11 runs in three games, but it doesn't leave much margin for error (Arizona scored 25 runs in its regional a season ago). It didn't much matter with McQuillin around. She didn't start Sunday after throwing four-hit and two-hit shutouts, respectively, in the team's opening wins, but after Mississippi State hit three home runs while she watched, McQuillin pitched 5⅔ no-hit innings in relief for her third win. She's now worked 31⅓ innings in her career in regionals and has yet to allow a run. Congratulations to @HailStateSB on an incredible season! Today was a great battle. Erica Russell thought she was going to take first base after getting hit by a pitch. A three-run double was better. Two pitches after she was called back to the batter's box for leaning into a pitch, Russell crushed a bases-clearing double in Texas A&M's seven-run fifth inning to help lead the Aggies to the super regionals with a 10-4 win over Baylor on Sunday in College Station. After Tori Vidales reached on a strikeout, Kelbi Fortenberry tied the game at 3-3 with an RBI double. With two outs in the inning, Kristen Cuyos walked on four pitches with the bases loaded to force in a run and bring up Russell, who knocked Baylor's Gia Rodoni out of the game with her double to the right-field corner. Samantha Show followed with a monster two-run homer off Regan Green to make it 9-3 and cap the seven-run outburst. A day after throwing a no-hitter to keep the Bears alive, Rodoni surrendered eight runs, eight hits and five walks in 4 2/3 innings. The Aggies will travel to Gainesville to play fellow SEC rep Florida. The Gators swept the regular-season series. Rain delayed the start of Kentucky's playoff opener. The Wildcats spent the rest of the weekend producing early finishes. The No. 16 seed scored 28 runs over 16 innings in three games and became the third team to run rule three straight games en route to a regional win. The highlights? Jenny Schaper hit a walk-off grand slam in the fifth inning against Illinois Chicago to set the tone. Later Saturday, Rachael Metzger hit a fourth-inning grand slam against Notre Dame. On Sunday, Metzger added three more RBIs before Abbey Cheek hit a solo homer in the sixth to give the Wildcats another walk-off, this one 8-0. Of course, while the offense was busy doing all that, pitchers Erin Rethlake and Grace Baalman allowed five hits and a single run over the three games. Kentucky next travels to Eugene to play top-seeded Oregon.